I almost forgot to post this. I got an email from a reader who said something along the lines of, "Don't think we forgot that you're supposed to be doing monthly hair updates." Hahaha! The promise was every other month hair updates, remember? But here we go! What can I say about my locs at 16 months? For the past two months, I've been combining them. Look how much thicker they are! I've had a total love/hate relationship with this experience. I know that it's necessary but I don't like it. I'm not 100% happy with how my locs look right now. Water seems to help them loc together quicker so I've been washing at least every week or every other week. At first the married locs did well on their one. 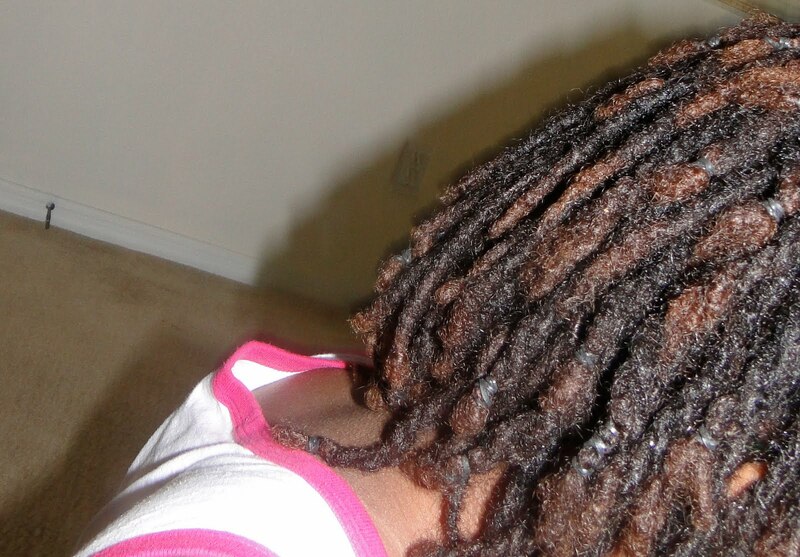 But I noticed that many of them unraveled and produced those wretched 2-headed dragon locs. No me gusta. So I've used rubber bands to keep the ends together. I HATE this look. It looks so...un-loc-ish and just...weird. After a wash and a week or so, the rubber bands come out. Can I be honest? Part of me wants to take these locs down and just start over. I am that unhappy with them right now. But I know it's just a phase. In the end, I will happier with stronger and thicker locs and I have to keep reminding myself that this is a journey. And it ain't supposed to be all gumdrops and sprinkles the entire way. Although I've been going through my own personal loc'd trials and tribulations, I have a greater appreciation for natural hair and locs, in general. The World Natural Hair Show in Atlanta put me on cloud nine, ten and eleven. I'm also doing a lot of styles. Like...a lot. Straight locs are a thing of the past. Curling the babies take too long so I've been trying to do style them myself. Still can't get a hold of that basket weave thing. And I've been hooked up with styles from the professionals. I've been using the Heads and Shoulders 2-in-1 and the locs seem to love it. My dandruff is still out of control but my scalp doesn't itch as much. And check this out...I haven't had a problem with build-up since visiting my loctician in February. This is a HUGE plus for me. Re-twisting via palm rolling with Organics Root Stimulator is still the way to go for me. Another plus about combining the locs is that you can't see where I've latched. Which is a good thing! So yeah...this update is different from my others in that I'm not THAT happy with where my locs are right now. Most of my updates are full of love and adoration for my hair but this whole combining thing has me in a rut. My hair is fuzzier than ever but I don't even care about that anymore. Let's hope the locs can magically combine themselves before I chop them off. I'm kidding...kinda. Oh...just how many have I combined? I went from 190-somethin' locs to 109. Wow-sers!! And now I'm thinking they are TOO thick. I know...I just can't be satisfied, uh? HA! At this point..I don't know what to do other than just deal with what I got and hope that I learn to love them again. Not that I hate them but....um, yeah...you know. Once these babies combine, I'm going to visit my loctician and get a bad summer color. Oh....yeeeeah! There is ALWAYS something to look forward to. Girl! I know exactly how you feel with the combining thing. I combined my locs at the first of the month. Well in the past few days, I have un-combined about 99% of them! I actually just blogged about it (http://imdippedinhoney.blogspot.com/2010/04/bipolar-ramblings.html). I feel better since I've done that. You gotta do you. 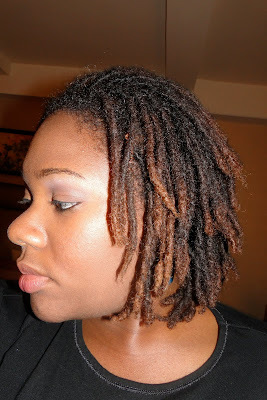 I think your locs are beautiful and the styles are great too. Just keep practicing and you'll get it. Who knew hair could be so emotional?! I am so envious of you lockers with the courage to combine. I want to do it so bad because I LOVE the thicker look. Your hair looks great with them smaller and now with them larger. Just let that hair do what it do because its looking good from here and its growing so nicely. Hang in there! Don't fret, sis!Your locs are pure awesomeness! You've just gotta give them a while to mesh together (the combined ones). Remember how long it took for your individual coils to loc? Well, these need some time as well. I think the washing is helping but, aside from that, just leave em alone & let nature do it's thing. Your locs are such an inspiration to me! Remember when it used to be the other way around? lol. You have taught me so much with your journey. That last updo is THE business! I love it! I want it! lol. So regal. If I could see the back of my head properly, I'd give it a try myself. HB---> Giiiirl, combining is so not for the weak. And I wish someone would have told me that. LOL! It's like going on another journey. Thanks for the motivation, sis. B---> Awww, look at all this love! I don't care what you say, you are still my loc'tor. I will try to leave them alone. So hard to do. Ohmigoodness, is it really going to take a good 3 months for these babies to mesh together? *tears* We need to go on a challenge and teach ourselves how to do up-do's. Deal? But we can't do that until I'm all meshed and whatnot, mkay? Love you, sis! I have just begun my journey and I am so grateful for your insight and all that has commented. It has helped me to start my journey and I know it will help me to continue!! I am only four months in and your posts have been inspiring. God knows, it's a struggle for me, but you are my inspiration, so be strong, girl! Girl I feel you on this totally. Your locs look great. I love the size. I started my locs by latching my locs. And here lately I'm a little frustrated with the progress. I talked about taking mine down to my husband and he said I can't believe after all the time and energy you are thinking of taking them down.... He just rolled his eyes... Lol..my problem is the back of my head from the ears down is xtra soft and fine. When I latched I think o spaced them 2 far??? Not really sure but it doesn't look full to me. I thought about redoing the back but dang a lot of work picking them out an relocking. Your locs are fine. They are beautiful. I went through the same thing, but if you can hang in there, your love for 'em will return! That's the thing about locs.. they never look the same at each stage and phase. Its part of the journey! I am with the rest of the crew. Your hair is beautiful and I love the charm! I think with some patience they will turn out exactly how you planned. Your locks look beautiful. Im at 6months and I've been going through my challenges but reading your blog has made me feel so much better. I know that my hair is exactly how it's supposed to be, right now and I just need to have patience and let it do what it do...LOL.